What Type Of Oil Should You Cook With? The Center for Disease Control and Prevention claims that extra-virgin olive oil is a popular choice to improve heart health. Extra-virgin olive oil contains a large amount of antioxidants and a body-protecting polyphenol known as hydroxytyrosol. This compound has been shown through research to have one of the highest free-radical absorbing capabilities. It contains vitamins A, E, D, and K, as well as beta-carotene, compound known to benefit immunity, vision, and overall health. Several myths exist that may influence you to assess all cooking oils as damaging for your health. 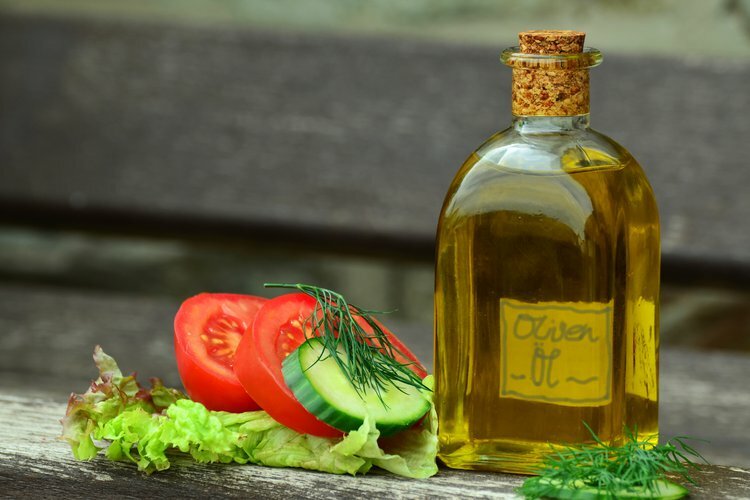 Although all oils are considered fat, some types of fat are essential for your diet, some of which can be used as cooking oil. It is important to be educated on the benefits of healthy oil vs. the risks of unhealthy oil. In terms of their effect on health, not all cooking oils are equal. Fats are categorized based upon their shape, as these shapes determine how fat performs when cooking. These categories of fat are referred to as saturated, monounsaturated, and polyunsaturated. Each substance termed as fat contain all of these shapes, but they are classified based upon which shape makes up their majority. There are certain rules you should follow when choosing cooking oil. It is best to avoid saturated fats and aim for either polyunsaturated or monounsaturated fats. Saturated fats, including butter, lard, and shortening, can increase the risk for heart disease and elevated cholesterol. Examples of polyunsaturated and monounsaturated fats include sunflower, canola, peanut, olive, or walnut oil. These oils are plant-based and help to improve blood cholesterol levels and decrease your risk for heart disease. The Center for Disease Control and Prevention claims that extra-virgin olive oil is a popular choice to improve heart health. It is made of 78% monounsaturated fat, 8% polyunsaturated fat, and 14% saturated fat, therefore it is considered a monounsaturated fat. Extra-virgin olive oil contains a large amount of antioxidants and a body-protecting polyphenol known as hydroxytyrosol. This compound has been shown through research to have one of the highest free-radical absorbing capabilities. It contains vitamins A, E, D, and K, as well as beta-carotene, compound known to benefit immunity, vision, and overall health. Olive oil has also been shown to reduce LDL (bad) cholesterol and raise HDL (good) cholesterol. A Spanish study identified olive oil’s effect against LDL oxidation in 2000. When LDL, or low density lipoproteins, get oxidized, they become dangerous to the body. This process can generate arterial inflammation and increase your risk for atherosclerosis, heart attack, or stroke. In comparison to various cooking oils, extra-virgin olive oil appears to have the most potential to positively impact your health. As simple as it is to add it to your daily cooking routine, there is no reason to not classify it as your primary cooking oil. Bogani P, Galli C, Villa M, Visioli F. Postprandial anti-inflammatory and antioxidant effects of extra virgin olive oil. Atherosclerosis. 2007;190(1):181-186. Uusitalo, U., Feskens, E. J., Tuomilehto, J., Dowse, G., Haw, U., Fareed, D., ... & Zimmet, P. (1996). Fall in total cholesterol concentration over five years in association with changes in fatty acid composition of cooking oil in Mauritius: cross sectional survey. Bmj, 313(7064), 1044-1046. Soriguer, F., Almaraz, M. C., García-Almeida, J. M., Cardona, I., Linares, F., Morcillo, S., ... & Valdes, S. (2010). Intake and home use of olive oil or mixed oils in relation to healthy lifestyles in a Mediterranean population. Findings from the prospective Pizarra study. British journal of nutrition, 103(01), 114-122. Takeuchi, H., Sekine, S., Kojima, K., & Aoyama, T. (2008). The application of medium-chain fatty acids: edible oil with a suppressing effect on body fat accumulation. Asia Pac J Clin Nutr, 17(Suppl 1), 320-323.